The Alzheimer’s Disease Therapeutics and Diagnostics Market will reach $7.93bn in 2018. 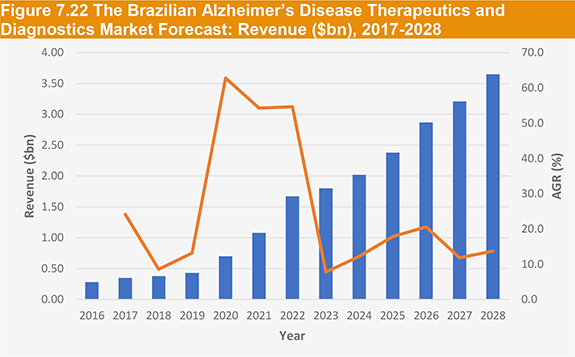 The Alzheimer’s Disease Therapeutics and Diagnostics Market is expected to grow at a CAGR of 12.1% in the second half of the forecast period. In this brand new 208-page report you will receive 62 tables and 82 figures– all unavailable elsewhere. The 208-page report provides clear detailed insight into the Alzheimer’s Disease Therapeutics and Diagnostics Market. Discover the key drivers and challenges affecting the market. • This report covers the qualitative analysis of the Alzheimer’s Disease Therapeutics and Diagnostics Market. It includes SWOT analysis: Strengths, Weaknesses, Opportunities and Threats of the market. • David Hung, Chief Executive Officer of Axovant Sciences Inc.
• Phyllis Ferrell, Vice President and Alzheimer’s Disease Global Platform Leader at Eli Lilly and Co.
Buy our report today Global Alzheimer’s Disease Therapeutics and Diagnostics Market 2018-2028: Leading Drugs, R&D Pipeline Drugs, Biomarkers, Leading Companies. 9.3 Interview with Phyllis Ferrell, Vice President and Alzheimer's Disease Global Platform Leader at Eli Lilly and Co.